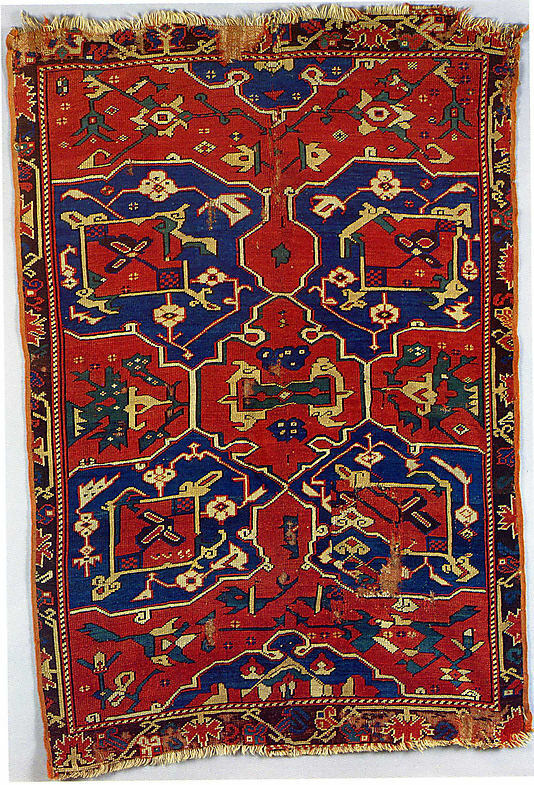 L. 109 in. 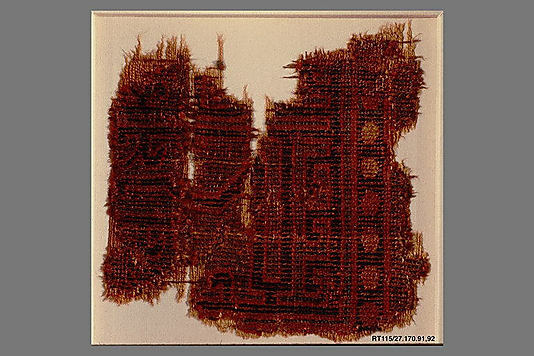 x W. 80 in. 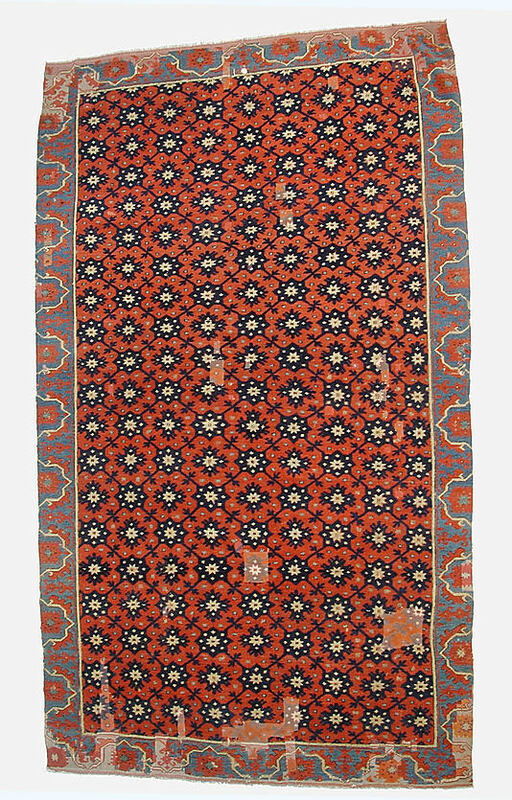 Named after a famous portrait by Hans Holbein the Younger that depicts a similar carpet draped over a table, the pattern of this early Turkish carpet is one of the most fundamental of all carpet designs. 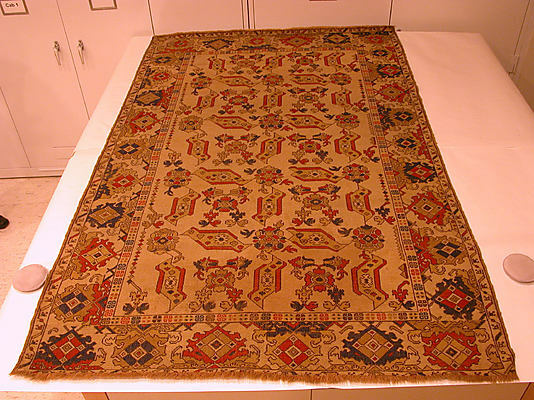 Many other carpet patterns are derived from its arrangement of small knotlike medallions and diamond-shaped strapwork. 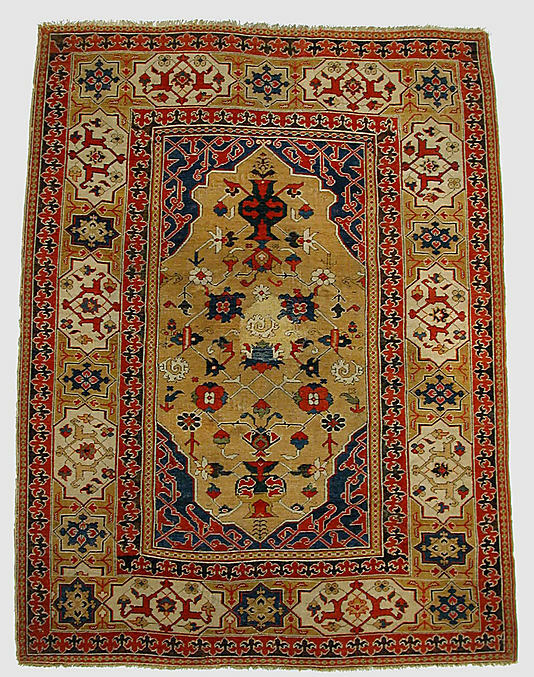 Its interlaced border is related to the kufic border found in many early 'Lotto' carpets. 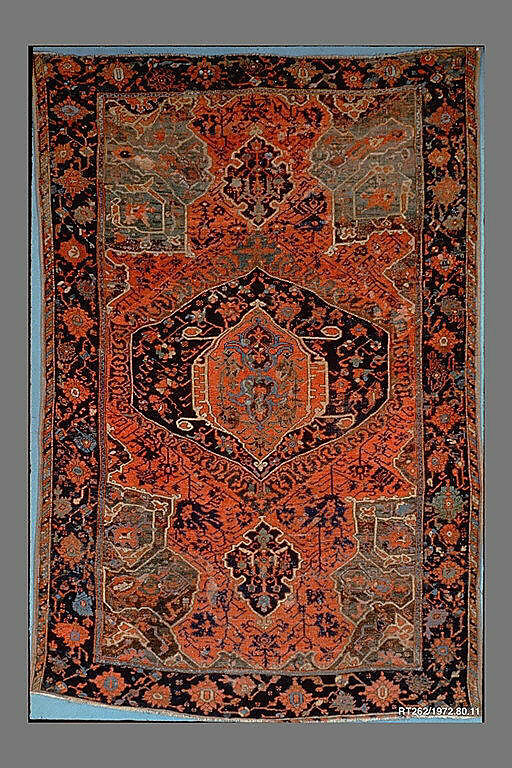 "Holbein" carpets were woven in Anatolia as early as the fourteenth century, and became popular in Europe from the fifteenth century onward. 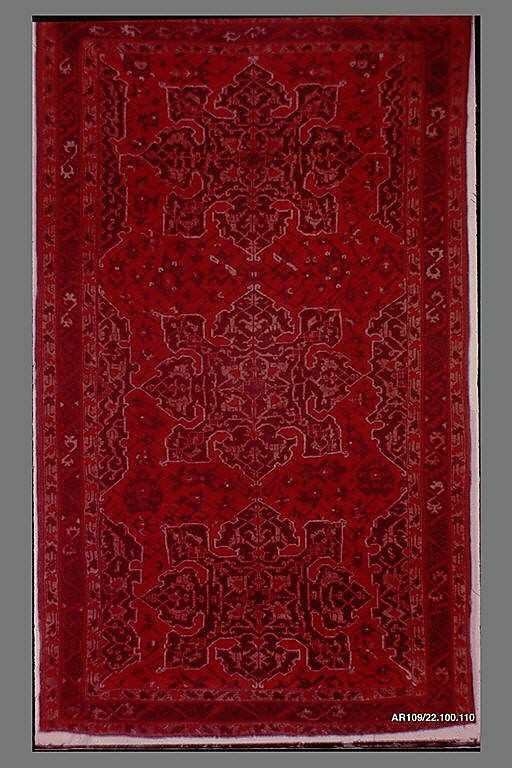 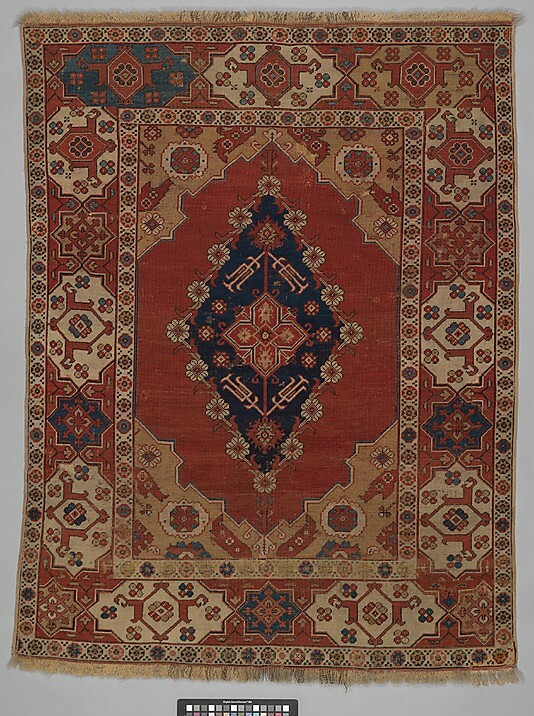 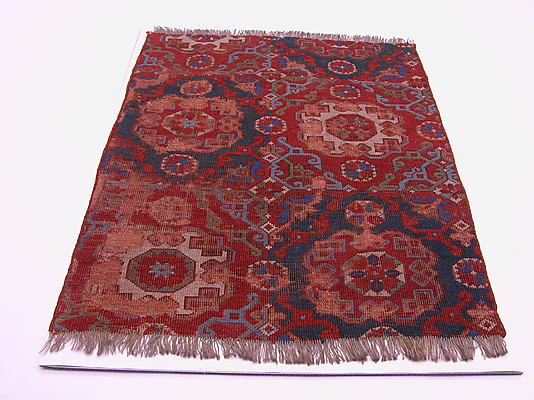 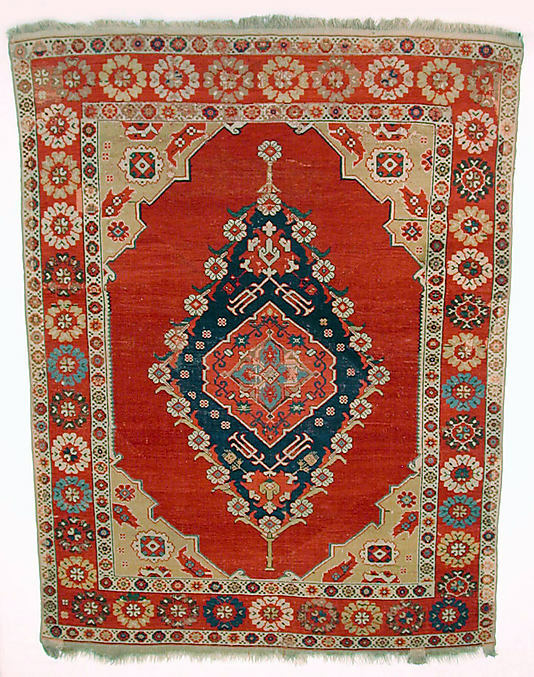 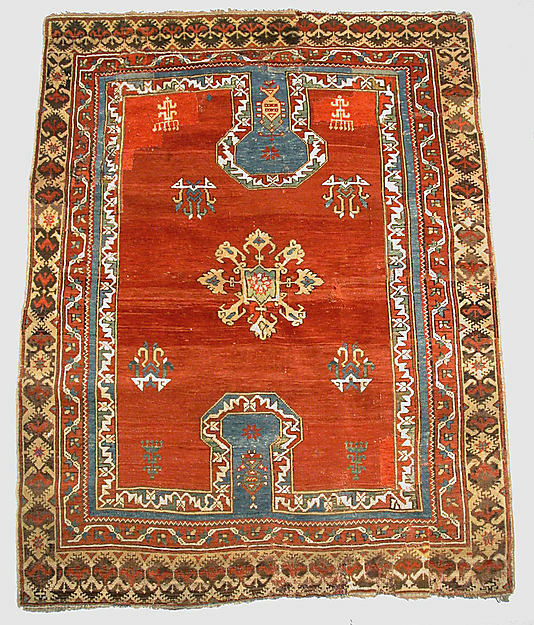 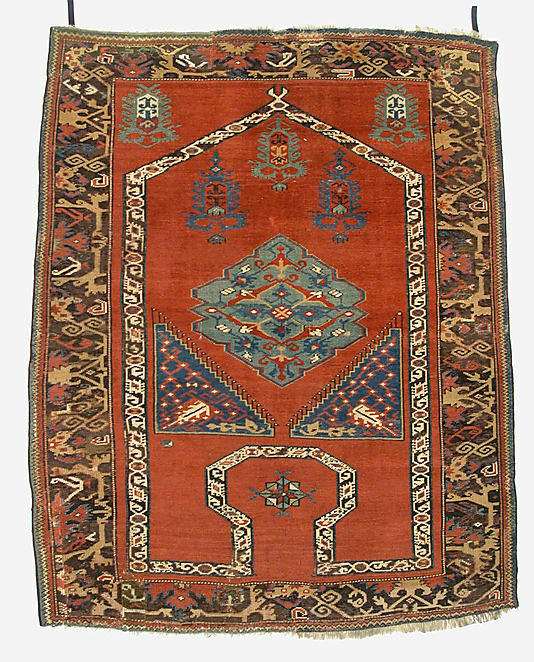 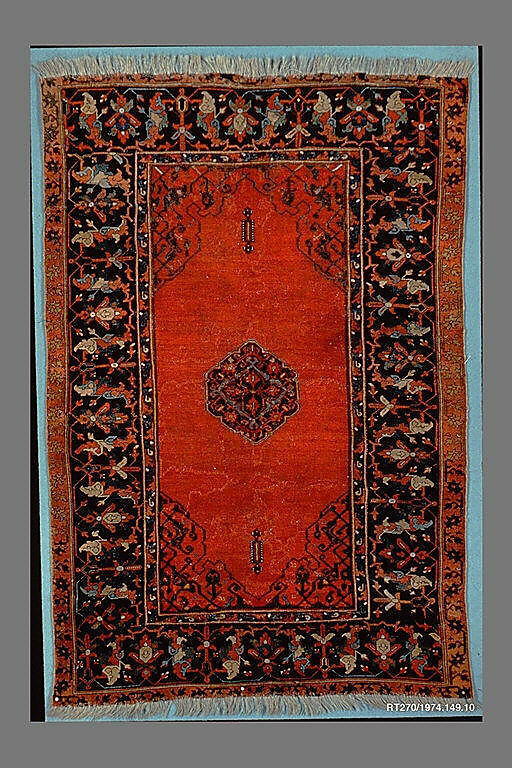 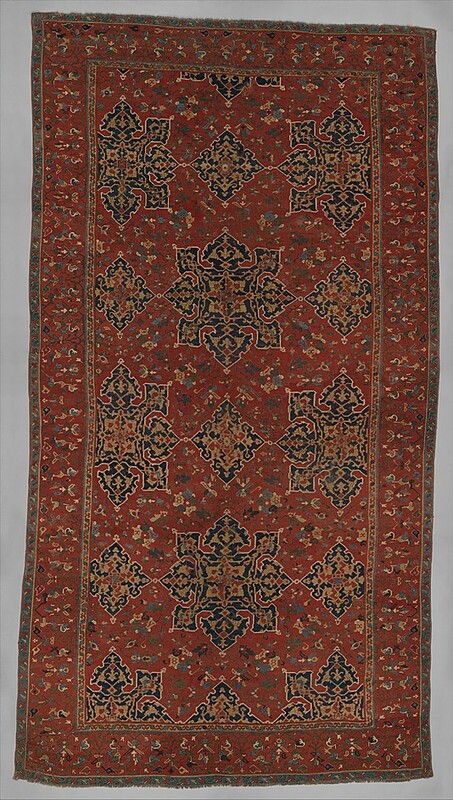 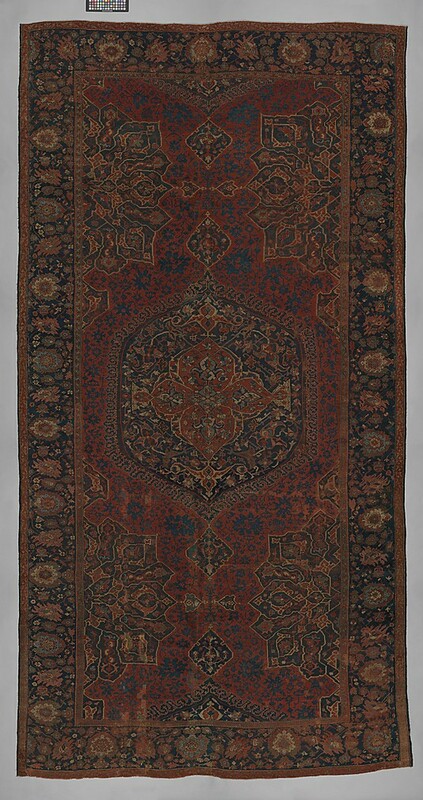 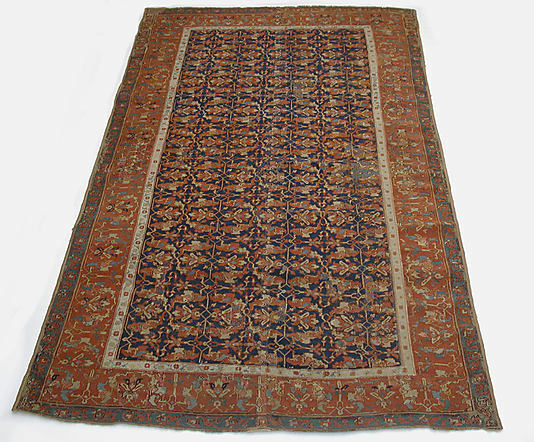 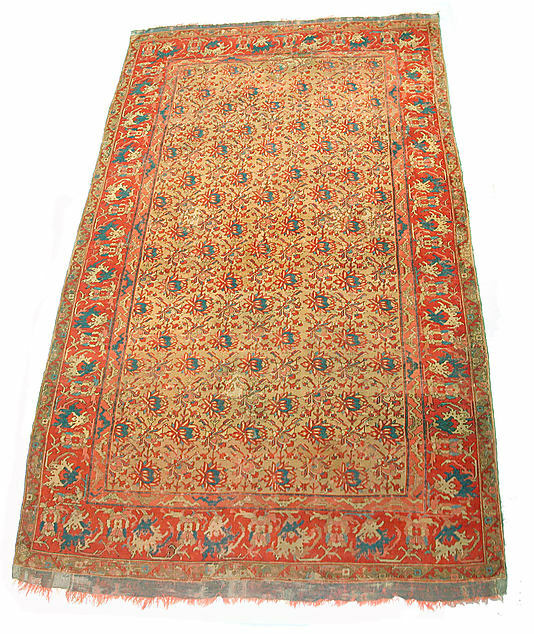 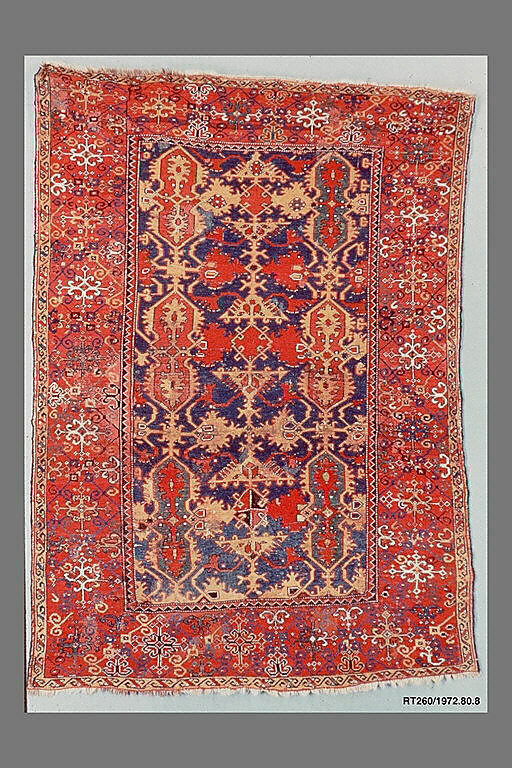 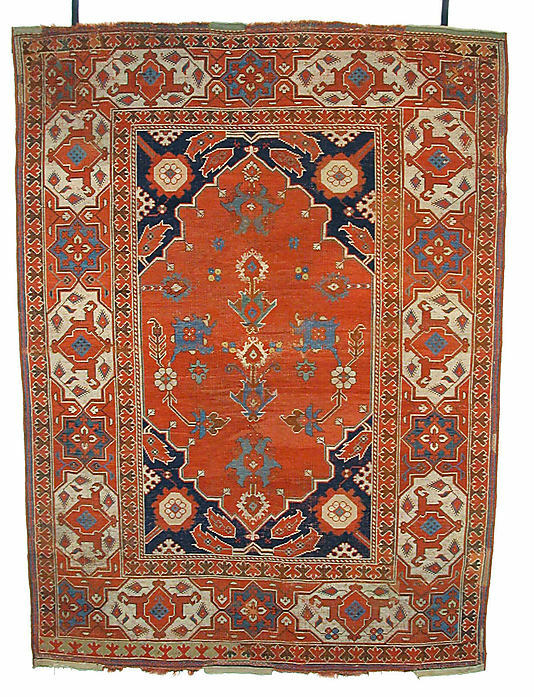 The starlike medallions that give this type of carpet its name were a favored design among commercial weavers of the Ushak district of western Anatolia. 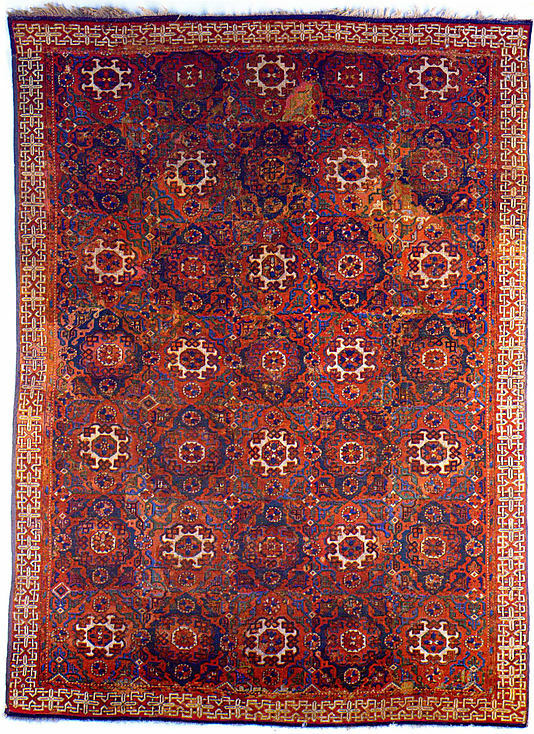 The inspiration for the infinitely repeating pattern may have its source in other media, such as architectural tilework. 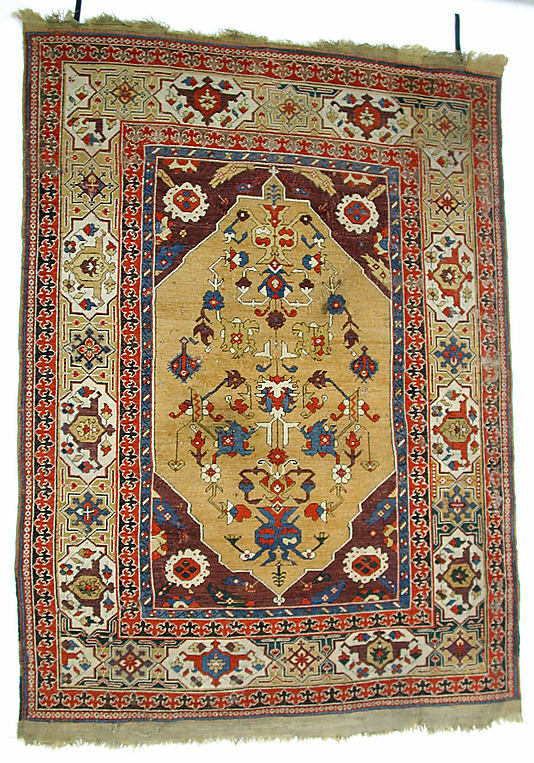 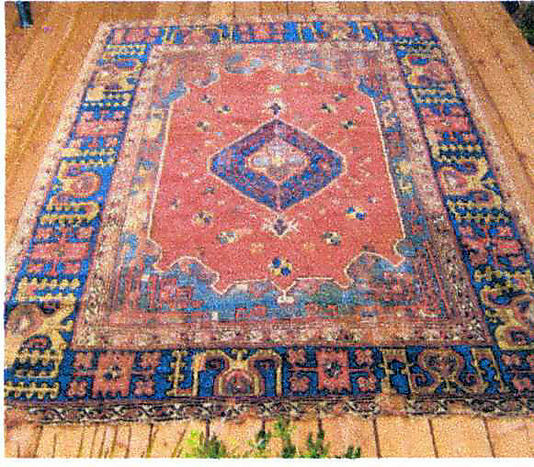 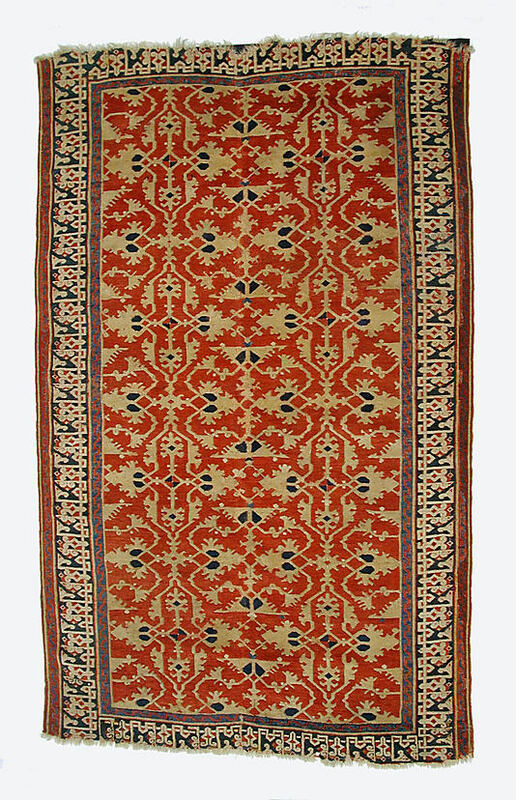 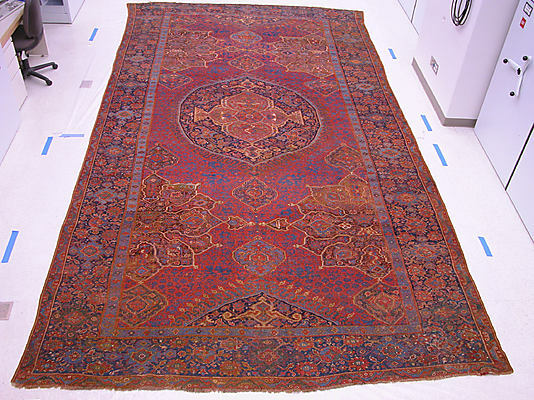 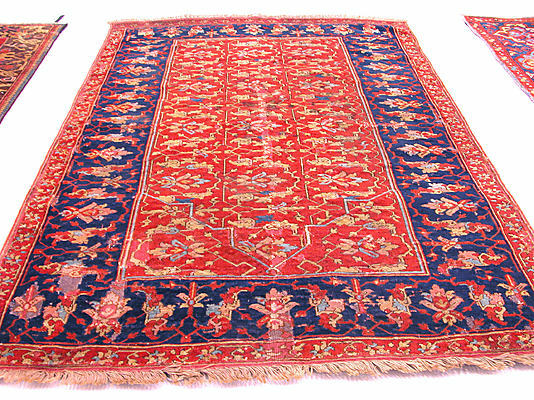 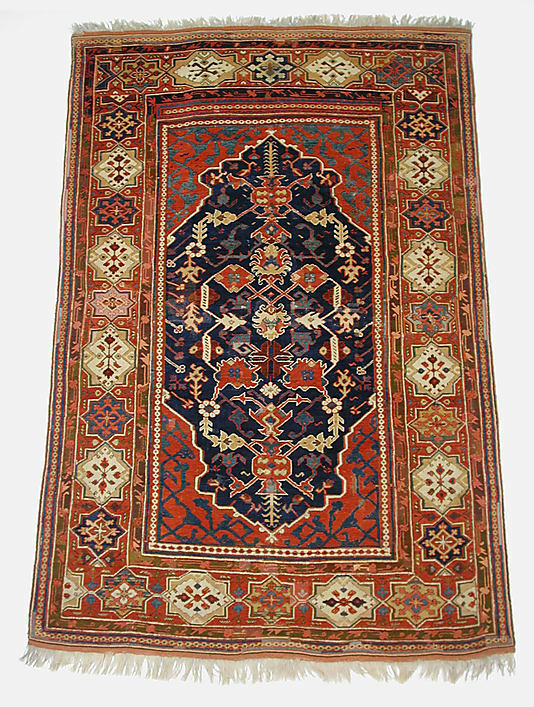 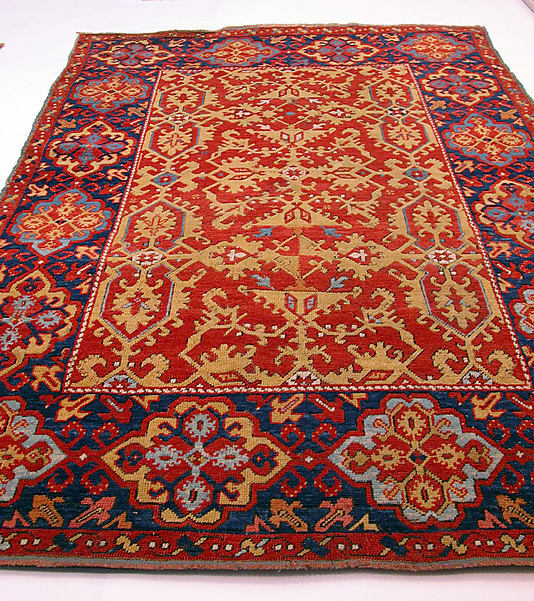 Most Ushak carpets are easily recognizable by their characteristic color palette of rich red, dark blue, and yellow, often highlighted with touches of bright white and fresh green. 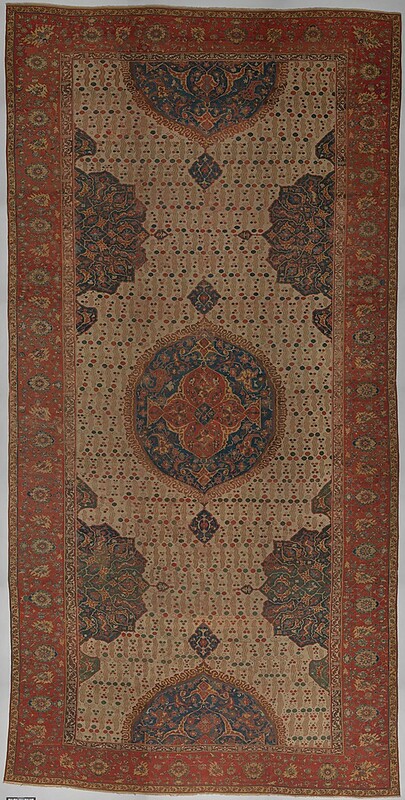 H. 69 in. 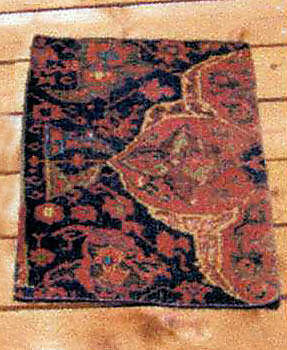 x W. 46 in. 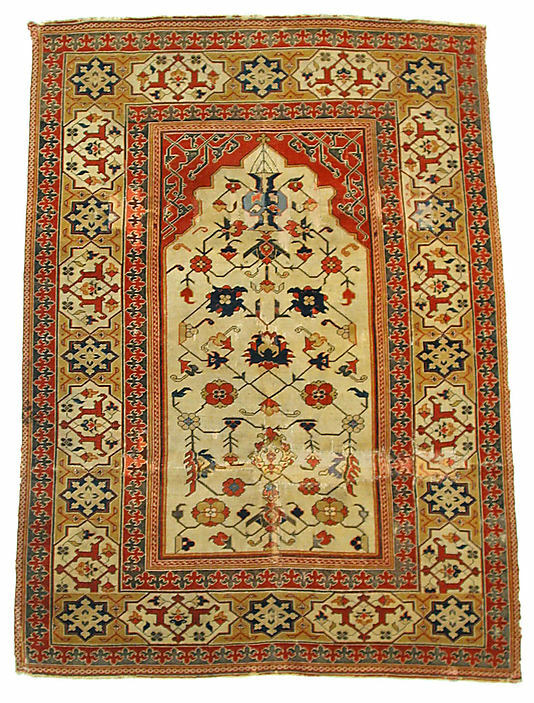 Carpets displaying this striking design of stylized vegetal arabesques in yellow on a red ground are often called "Lotto" carpets after a famous altarpiece by Italian Renaissance painter Lorenzo Lotto that depicts a similar carpet. 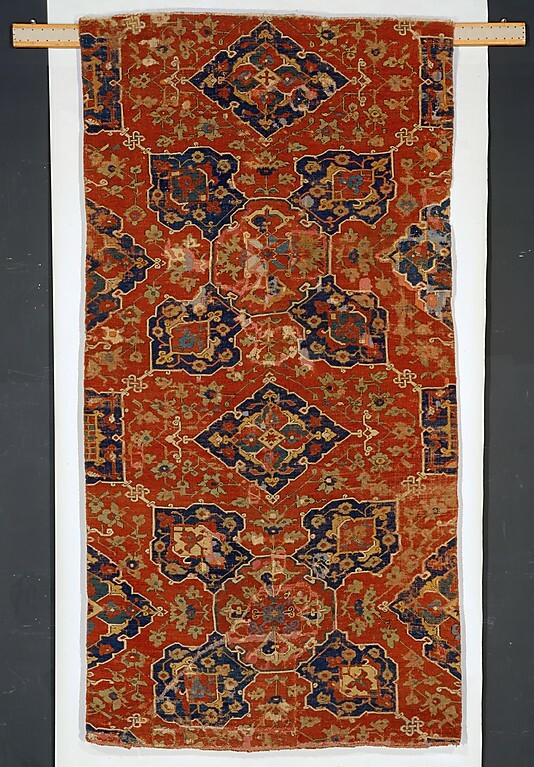 Early examples of Lotto carpets exhibit borders like the one seen here. 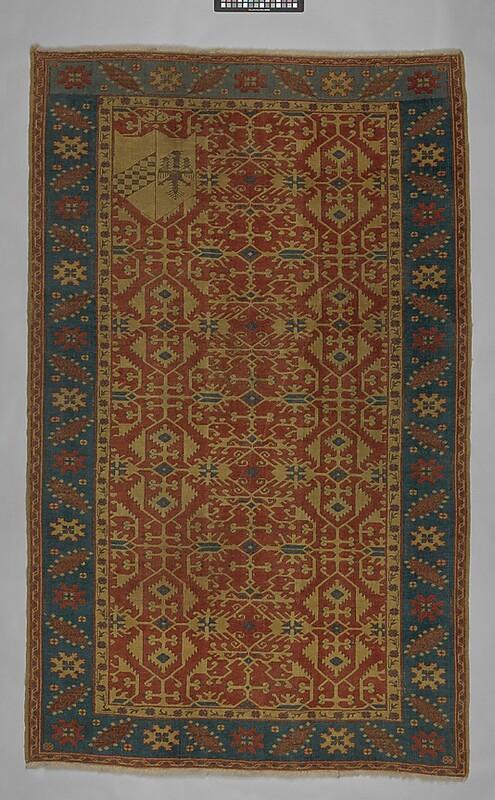 Thought to derive from a rectilinear form of Arabic script known as kufic, this type of interlaced border is characteristic of many early Turkish carpets. 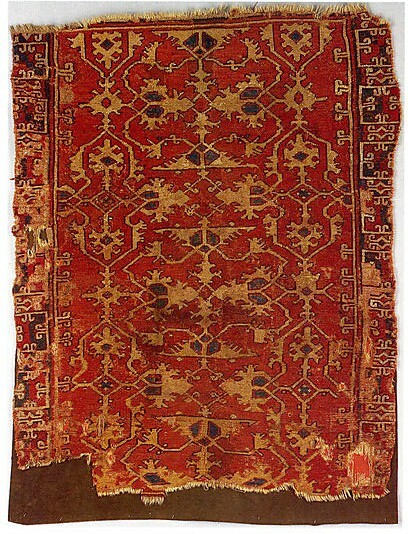 L. 50 in. 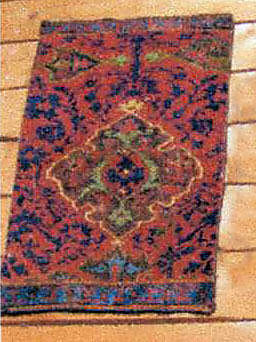 x W. 39 in. 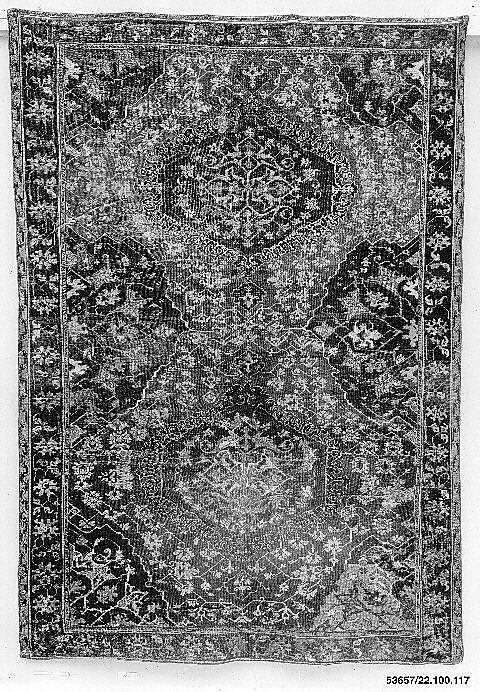 L. 25 in. 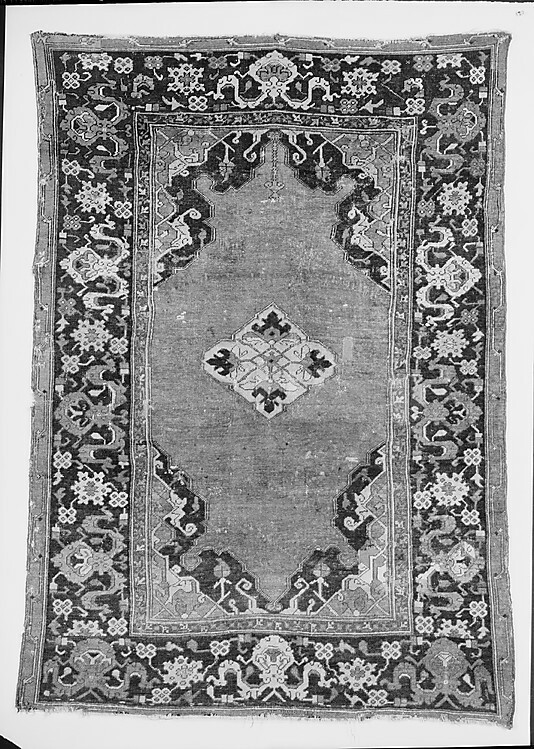 x W. 10 in. 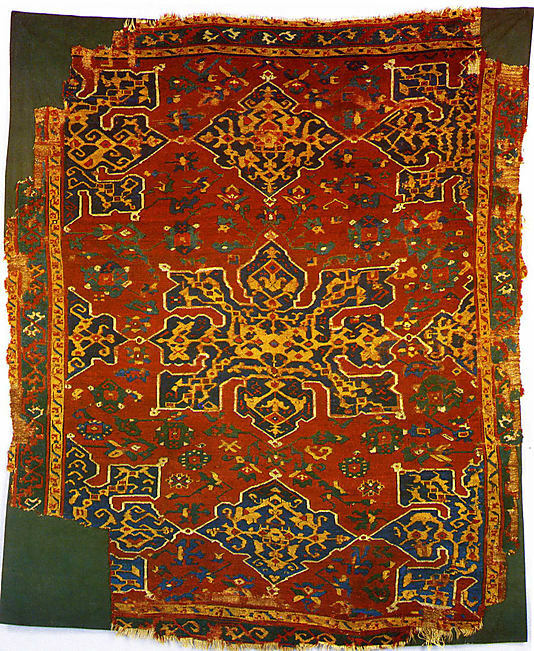 L. 89 in. 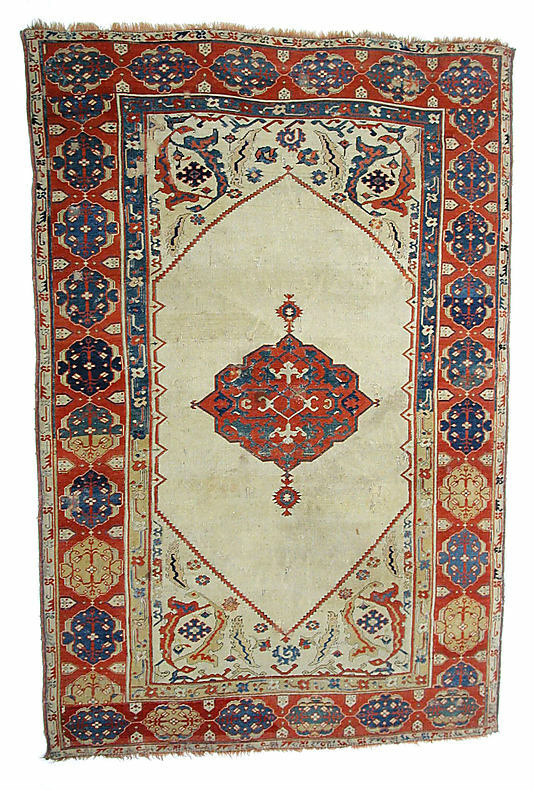 x W. 70 in. 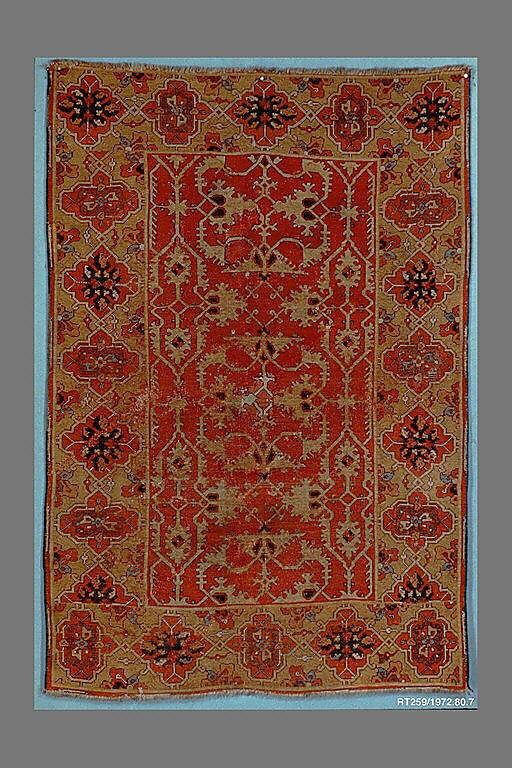 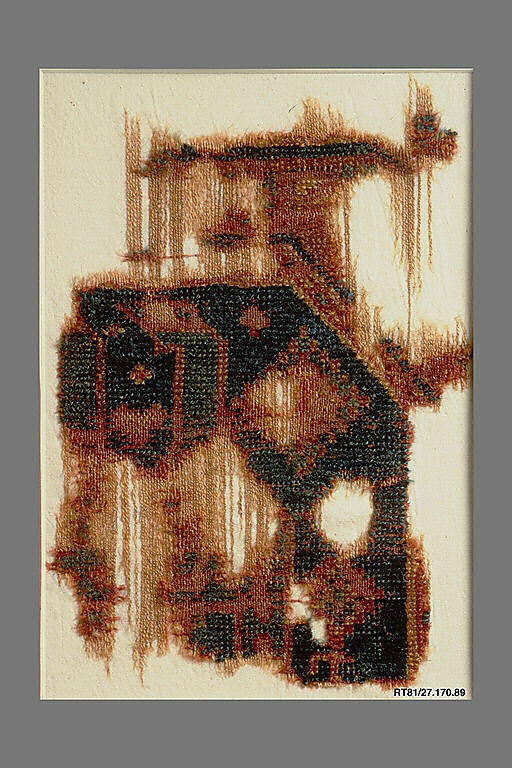 The significance of the unusual "keyhole" motif in the bottom portion of this and other similar carpets is a source of debate. 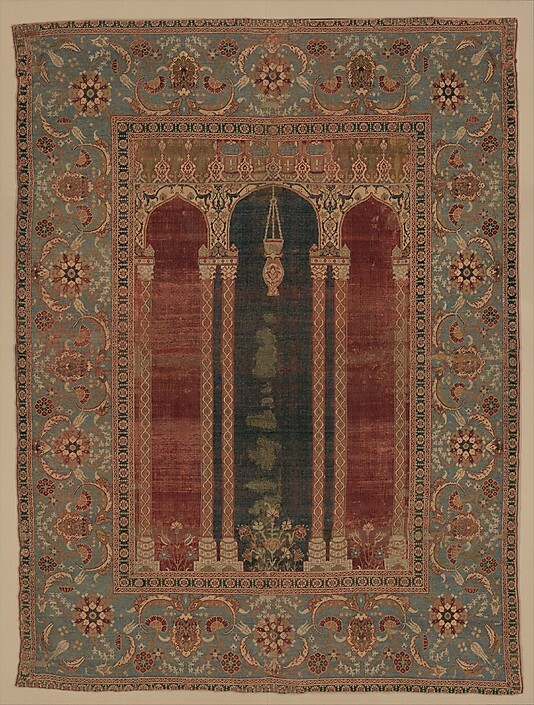 Some scholars interpret it as representing a mihrab (a niche indicating the direction of Mecca) or a gateway, while others see it as a fountain associated with ablutions performed before prayer. 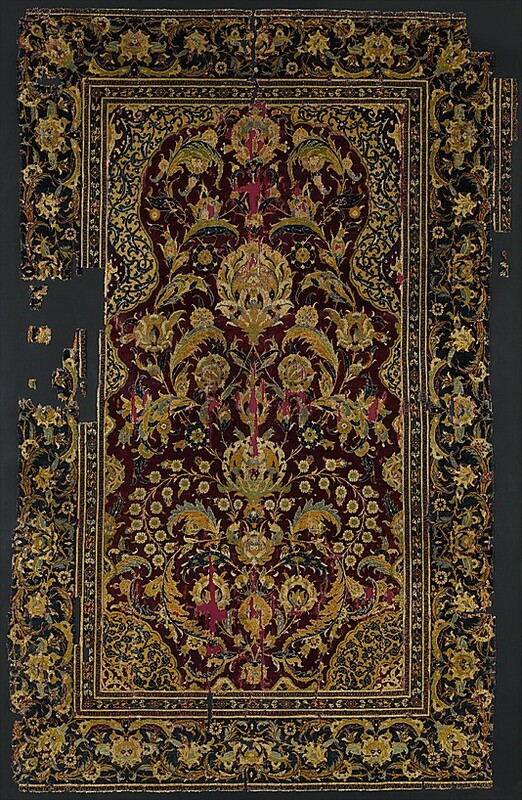 Carpets exhibiting this design have come to be known as "Bellini" carpets, after the Venetian artist Giovanni Bellini (d. 1516), who portrayed such weavings placed under the feet of the Madonna in his paintings. 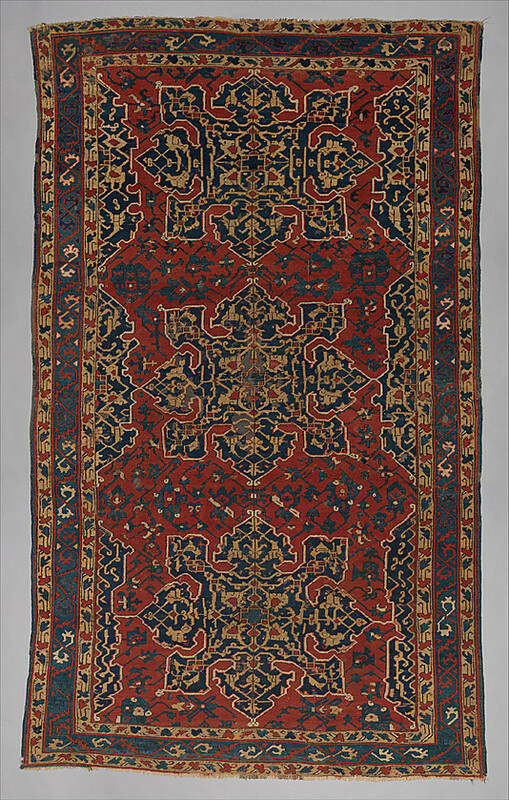 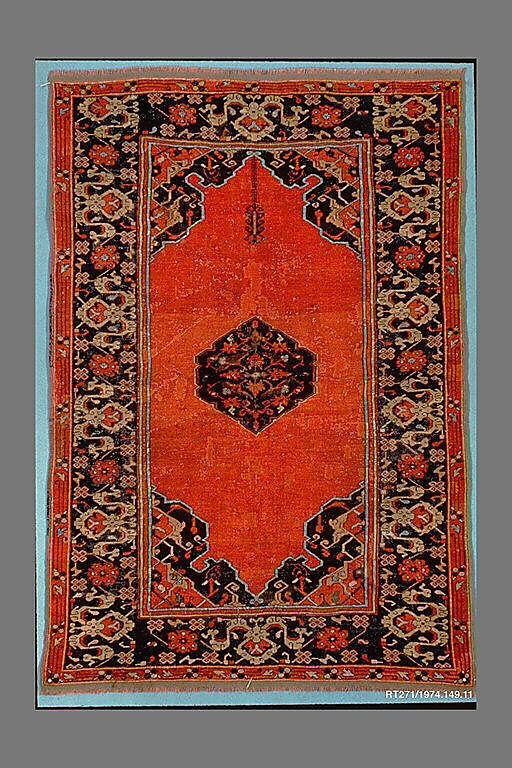 Large numbers of western Anatolian carpets such as this one were imported into Europe during the seventeenth and eighteenth centuries. 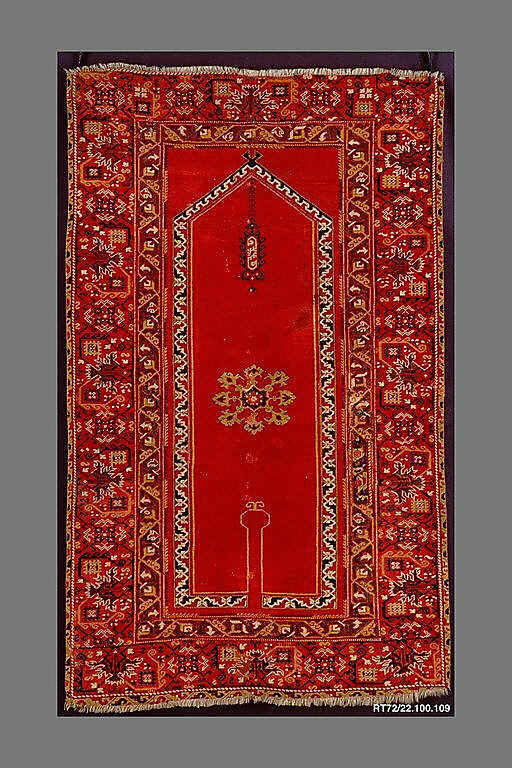 So many were donated as pious gifts to churches throughout Romania and Hungary that they came to be known as "Transylvanian" carpets. 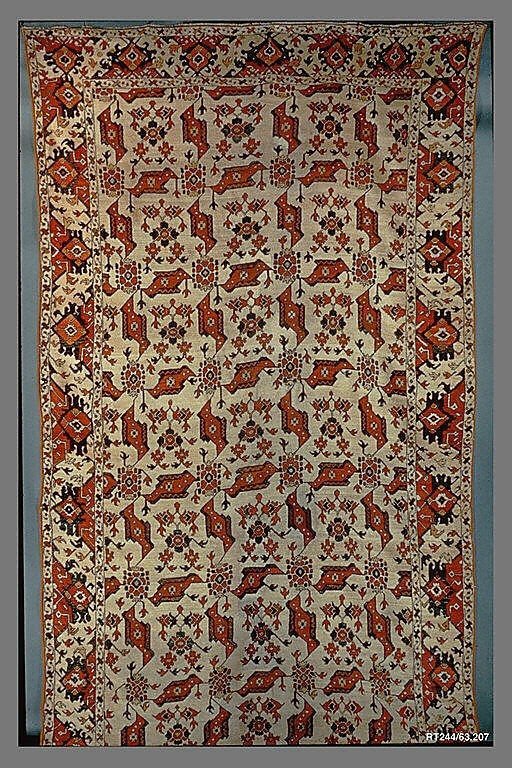 Identifiable by distinctive border designs, their central motif likely is based upon Turkish prayer rugs. 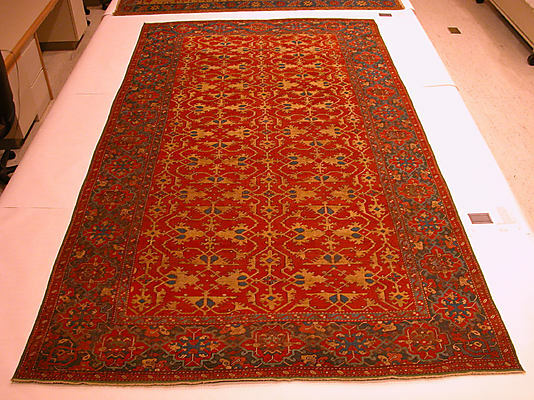 They were popular in Europe well into the nineteenth century. 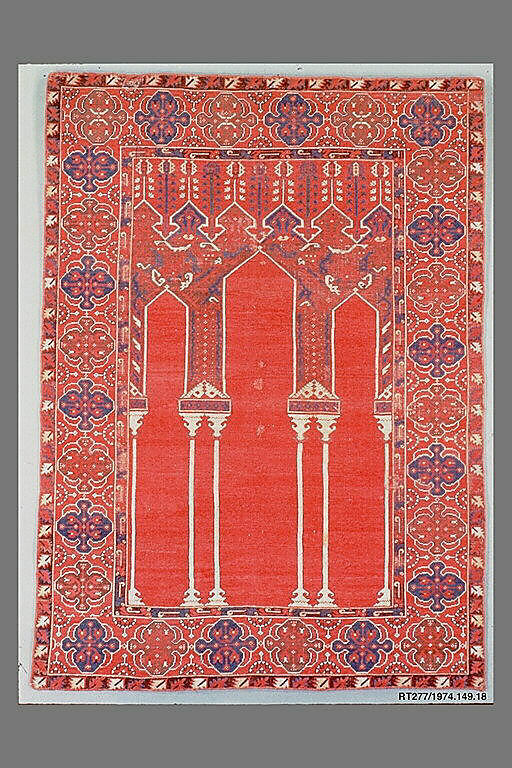 With its highly geometricized design, this wool rug differs markedly from the refined courtly carpets, and represents an earlier tradition of weaving that was popular in Europe, where rugs like this are found in fourteenth- and fifteenth century churches and paintings. 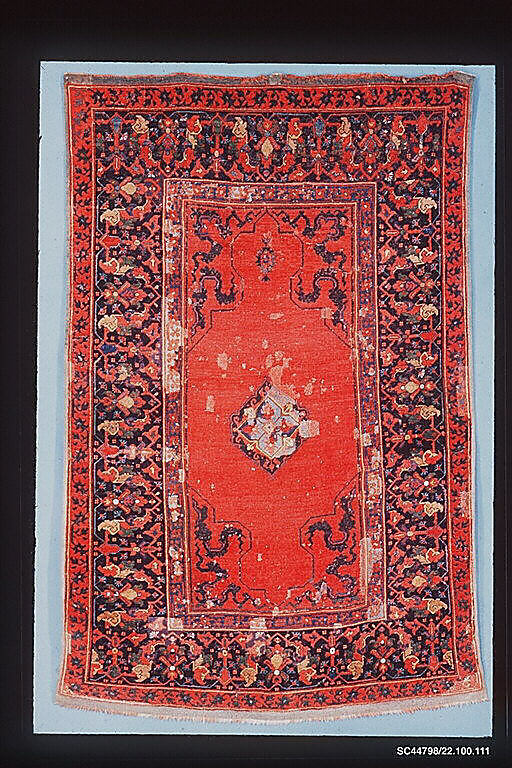 In fact, the depiction of a rug with the same design as this in an early fifteenth-century Sienese painting allowed for the dating of this example. 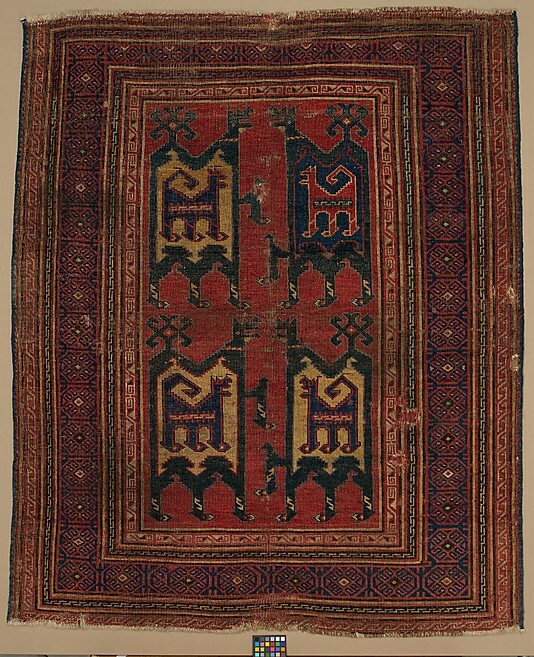 This is one of only three complete rugs of such an early date and its design of large confronted animals, each with a smaller animal inside, probably derives from contemporary textiles. 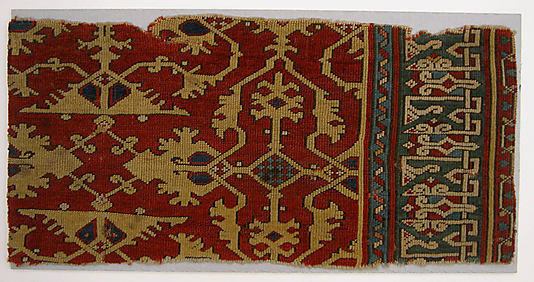 This fragment, one of the oldest surviving examples of Turkish carpet weaving, is related to a group of early carpets found in mosques of central Anatolia. 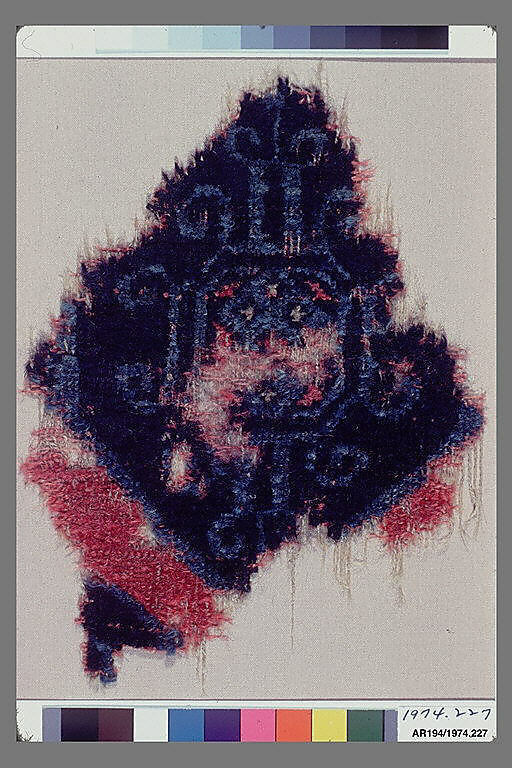 Originally, the pattern consisted of rows of dark blue hexagons, one of which is still partially visible here.